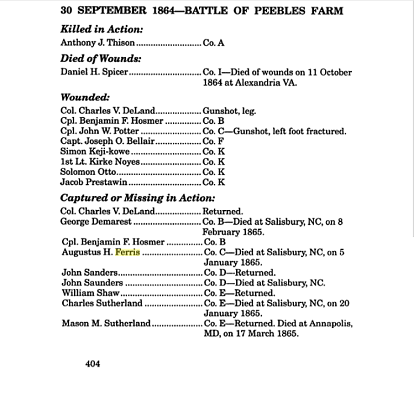 1st Michigan Sharpshooter losses Peebles Farm. Click to go to the book that this is an excerpt from. On September 30, 1864, Union forces under General U.S. Grant were pressing the Confederate defenses in Northern Virginia severely. Forces, including Co C, 1st Regiment Michigan Sharpshooters, were advancing against an understrength corps under General A.P. Hill. After initial success in the area of the Peebles’s Farm (or Poplar Springs Church) in the western portion of the advance, Union forces failed to secure a corps boundary and a Confederate attack routed the IX Corps. On September 30, four divisions from Generals Gouvernor K. Warren’s and John G. Parke’s corps struck a Rebel redoubt (an earthen fortress) at Poplar Springs Church that was easily captured along with a section of trenches. But Confederate General Ambrose P. Hill, in charge of the Petersburg defenses, was able to bring two divisions from other parts of his line to stop the Yankees, and a counterattack prevented the loss of any more territory. The Yankees would try again on October 1, but would be unsuccessful. The Union lost 2,800 troops, including nearly 1,300 captured during the Confederate counterattack. Lee’s army suffered only 1,300 casualties, but they were much more difficult for him to replace. The Southside Railroad, the object of the attack, was still in Confederate hands, and the armies settled back into their trenches. In that action, the Michigan Sharpshooters had one KIA, one man who would later succumb to wounds, 8 wounded, and 18 men were MIA or captured. The route was so complete that the regimental commander, Col. Charles V. DeLand, was captured. One of the POWs was Augustus H. Ferris. He was imprisoned at the camp at Salisbury, NC, where he died in January, 1865. The Confederate government established the Salisbury Prison in October 1861 on the site of an old cotton factory enclosing a portion of the grounds with a stockade fence in preparation for the first prisoners. Designed to hold about 2,500 persons, the prison was intended for Confederate soldiers who had committed military offenses and prisoners of state. However, the first Union soldiers arrived in December from Richmond, Virginia, in an effort to reduce the number of prisoners of war there. During the early years of the war, prisoners at Salisbury received adequate shelter, rations, water and sanitation. The situation changed rapidly on 5 October 1864, with the transfer of 5,000 prisoners of war to Salisbury. By the end of the month, more than 10,000 men were incarcerated in the prison. Overwhelmed by a population four times larger than intended, the prison quartered prisoners in every available space. Those without shelter dug burrows in an attempt to stay warm and dry. Rations and potable water were scarce. Adding to the poor conditions was an unusually cold and wet winter. Disease and starvation began to claim lives, and all buildings within the stockade were converted to hospitals to care for the sick. 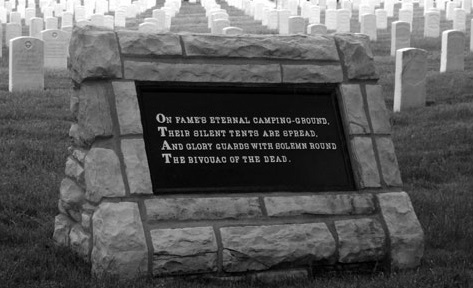 Each morning, the dead were gathered from the grounds and placed in the “dead house.” Later, they were removed for burial in trench graves located in a cornfield west of the prison. Although no complete burial lists for the prison exist and no headboards were used to mark the graves, records indicate that approximately 3,700 men died between October 1864 and February 1865. Surviving prisoners were released at the end of February when a prisoner of war exchange was carried out. Union forces burned down the prison in April 1865. Ferris was born in 1836 to Henry Hayes Ferris and Hannah Terpening. The family was part of a small migration to the Hillsdale County, Michigan region. Henry also served in the Civil War, rising to a Sergeant in Company G, Second Michigan Cavalry. Augustus Harvey Ferris was the sixth great grandson of Jeffrey Ferris through his son, James. He married Silvia Reed in 1857, and they had one son, Forrest G. Ferris. Forrest and his son, also Forrest, were prominent attorneys and political activists in the St. Louis, Missouri, area in the late 1800s and early to mid 1900s.